Professor Wismüller's group is interested in building intelligent image acquisition and analysis systems in biomedicine. Specifically, the focus of our research is on developing robust and adaptive systems for computer-aided diagnosis in biomedical imaging which combine principles and computational strategies inspired by biology together with machine learning and traditional image processing/computer vision approaches. To build such systems, we pursue research in both theoretical and applied engineering, computer science, and medicine, with a specific emphasis on computational intelligence, neural networks, and bio-mimetic computation. Here, we focus on innovative strategies for exploratory data analysis and visualization of high-dimensional biomedical data sets and self-organizing systems for pattern recognition. Based on the multi-disciplinary qualifications of our research group members in both biomedical engineering and medicine, we have a strong background in applying these research topics to relevant real-world problems in radiology, molecular imaging, and bioinformatics. 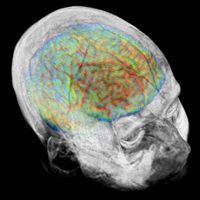 This includes research projects in the fields of functional MRI for human brain mapping, MRI mammography for breast cancer diagnosis, image segmentation in Multiple Sclerosis and Alzheimer's Dementia, multi-modality fusion, and biomedical time-series analysis in molecular imaging. Researcher: Axel W. E. Wismüller, Ph.D.